In March 1913 Luigi Russolo, the Italian futurist, stormed out of a classical concert in Milan and published an open letter demanding a new form of modern music. Known as “the Manifesto for an Art of noises”, his letter described how this music might sound. It was to be made up of modern sounds and the noises of nature; the buzz of electricity cables, hissing of steam and rhythmic beat of the factory floor. Russolo was an artist, not a musician, but he started making the new music himself and in April 1914 gave the first ever electronic music performance, using his self-made precursor to the synthesiser, the intonorumori. None-the-less, the seed Russolo planted grew into an oak. As Karl Bartos , former Kraftwerk member, explains: “Russolo was the first in the chain of the development of electronic music, followed by Pierre Schaeffer in Paris in the Forties, and Stockhausen in Cologne in the Fifties. There’d been attempts to create electronic instruments before Russolo, but it was after him that electronic instruments got onto a more serious footing - with the Theremin being created in 1920 and the first electronic compositions starting to be written soon after; including a piece by Luigi’s brother, Antonio Russolo. The start of the Thirties saw Laurens Hammond establish an electronic instrument manufacturing company - which produced the Hammond Organ, while Germany’s AEG company developed the first modern tape recorder. Tape introduced a vast range of possibilities. Having the plasticity of film it could be slowed down, sped up or played backwards, often with dramatic effect. It could also form “loops” that repeated patterns and could be used to create delays and echoes, an effect that would re-emerge decades later as a staple of disco DJs. The tape recorder was adopted by a group of composers in Paris, who used it to make a new form of music - dubbed ‘musique concrète’. The first concrète pieces were assembled by Pierre Schaeffer, who debuted his new music on radio in 1948. Not long after he hooked up with Pierre Henry and in 1950 performed the first live musique concrète concert - using turntables and mixers. Amongst the musicians orbiting Schaeffer was Karlhienz Stockhausen, who worked briefly for Schaeffer in 1952, before leaving to join the WDR Cologne Studio for Electronic Music - where his work directly influenced acts such as Can, and Kraftwerk. The late fifties saw significant progress in synthesiser technology, not least in the introduction of the Clavivox Synthesiser - which had been sub assembled by a young engineer called Robert Moog. 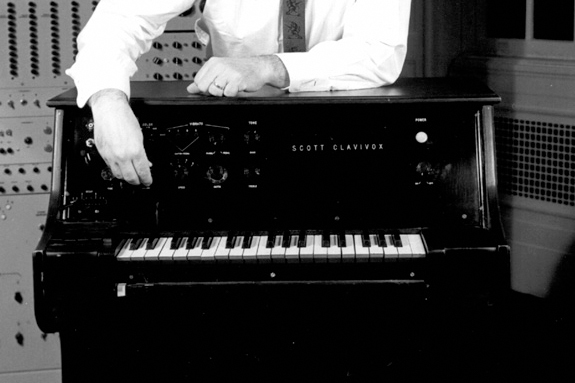 Driven by a love of of jazz and electronics, Moog had developed components of the synthesizer alongside composer Herbert Deutsch, while at the Columbia-Princeton Electronic Music Center. As the Sixties dawned, electronic music was still a high art phenomena, divorced from the burgeoning teenage pop scene. Luckily a Frenchman called Jean Jaques Perry was about to change that. Perry had originally been working with electronic music in France. But his experience in America, producing music for adverts, started a course towards a more accessible forms of electronic music. Perry began looping tape to create pop music and, after returning to Paris, released the chart hit ‘EVA’, introducing electronic music to 1960s pop. Simultaneously the wider public was being acclimatised to electronics through different channels. The BBC’s Radiophonic Workshop had been set up in 1958 and had started accustoming the nation’s ears to electronic sounds. Its co-founder, Delia Derbyshire, became renowned for her 1963 version of Ron Grainer’s Doctor Who theme. Psychedelia became a springboard for the next phase in electronic music’s evolution, as synthesisers and the use of tape manipulation transferred to rock musicians looking for new sources of inspiration. In the period following the Beatles, synthesisers became portable. The mini Moog was released in 1970 and became one of the first widely available synthesizers, with Herbie Hancock pioneering it as a touring instrument. 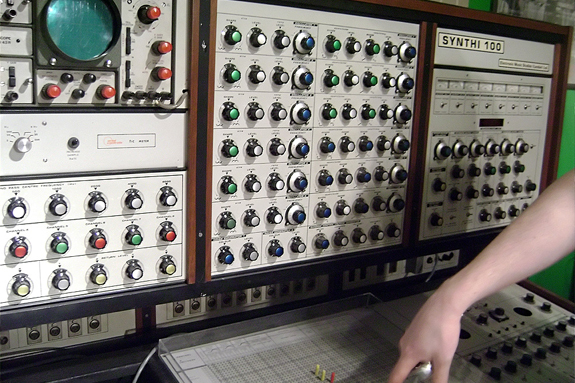 By 1974, the WDR studio had began producing the EMS Synthi 100, while Korg produced the MS-10, winning over acts such as Silver Apples, Pink Floyd, Yes, Hawkwind, Brian Eno and Sparks. Perhaps the purest development of new electronic music took place in West Germany, where Krautrock band Can formed a direct link between the electronic music of the conservatoire and rock music - keyboardist Irmin Schmidt had studied under Stockhausen. Karl Bartos was also working as a classical musician, playing Cage and Stockhausen’s concerts, when Kraftwerk approached him to play. “They called my professor and said they needed a classically trained student for a US tour. Soon they found I also knew about pop music, and that I was a composer. We fitted together perfectly.” Bartos went on to co-write some of Kraftwerk’s most iconic electronic material. Meanwhile Giorgio Moroder brought synthesiser sounds into disco after a chance meeting with a conservatoire composer. The composer had access to a large studio based synth and invited Moroder to visit. Moroder listened politely, but, shortly after, snuck back to the studio and asked the engineer to show him what the machine could really do. Soon bass lines were bubbling out of the synthesiser and into Donna Summer’s ‘I Feel Love’. Even as Disco was throbbing to a new electronic pulse, the aftermath of punk was ushering in new attitudes. Human League and Heaven 17 founder Martyn Ware says this idea was present at the start of the Sheffield scene: “Our vision, even at the very early stage, was to create a new music purely using electronics. With more electronic instruments entering the second hand market, the era saw pioneering bands respond to the cheaper hardware. Amongst them were New Order, OMD, Japan and Depeche Mode. Electronic music had given life to one of the most successful periods of British music since the 1960s. 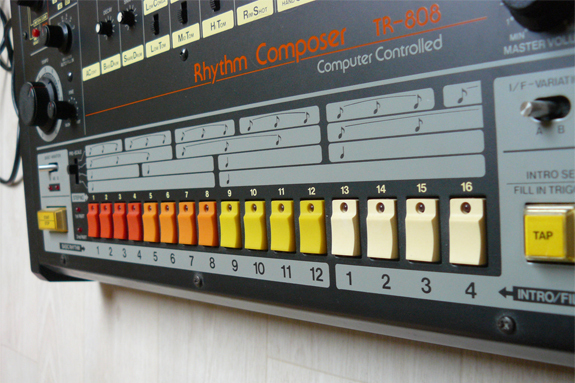 In 1980 Roland released the TR-808, one of the first fully programmable drum boxes. Roland’s new machines ushered in a new era and would soon gain notoriety with Marvin Gaye’s ‘Sexual Healing’ and Afrika Bambaataa and Arthur Baker’s ‘Planet Rock’. “Drum machines kind of put drummers out of work in the 80s,” recalls Leee. Coldcut’s Matt Black had been inspired to take up DJing by Grandmaster Flash’s scratch mixing and the DMC school of beat matching. But he’d also been making synthesisers since he was at school and had been in university bands and was aware of the basics he needed to record. Using this home set-up, Matt recorded a mix, inspired by Double Dee and Steinski’s cult releases. He played the result to an established DJ called Jonathan Moore, and they started collaborating as Coldcut, releasing Matt’s mix as their first record: ‘Say Kids What Time Is It’. One old technique used by Coldcut came through an engineer they’d been recording with called Raine Shine, who showed them a trick borrowed from musique Concrete. “Raine showed us how to make a seven foot tape loop that ran off the tape machine onto a broom handle and back again,” says Matt. 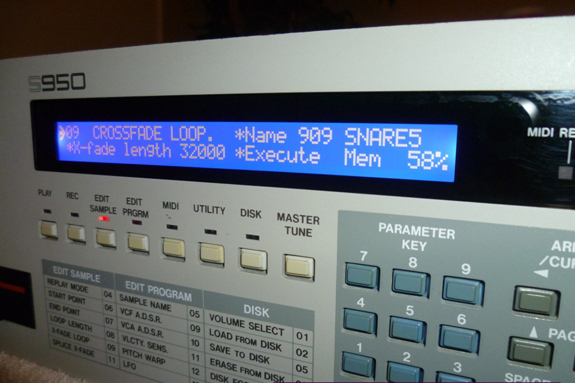 The game changer in samplers was the Akai S900 and the MPC sampling drum machine. From here onwards a new generation of producers were able to use the combination of a new industry standard, MIDI, Atari sequencers and ever more powerful samplers, to create records in their bedrooms. The second hand market was also benefitting small scale producers. Young creatives used this recycled gear in ways never imagined by their creators. DJ Pierre recalls buying a second hand Roland TB303 and switching it on to hear acid house bubbling out. House music was already established, but the explosion of acid and the media furore that followed, turned it into the UK’s biggest youth cult of the last 30 years. Acid house led to raves, which led to drum n bass, trip hop, UK techno, nu disco, big beat, dub step and many more sub genres still evolving today. Recent technological innovations have primarily moved into the virtual world, with software development, such as Reason, Ableton and Traktor, although a new generation of performance based hardware devices, such as Korg’s Volca series, is currently re-invigorating interest in hardware. Bartos argues that both hardware and software will flourish side by side in the future, much as paper and pen have survived into the computer age. But whether the future lies in hardware or software, or both, it’s certain the next chapter of Russolo’s 100 year old legacy is already in the production process. Which isn’t bad going for a story that began with a riot.